The Republic of Korea Navy (ROKN) is rapidly becoming one of the world’s most powerful naval forces. Yet it remains an understudied organization and is often discounted in wider calculations regarding strategic stability in maritime East Asia. The ROKN has undergone sustained modernization since the early 1990s and having largely achieved superiority over its North Korean counterpart is now developing a new set of missions in case of war on the Korean Peninsula. It also plays an important role in South Korea’s strategic approach to East Asia and is central to Seoul’s military response to China’s rise. 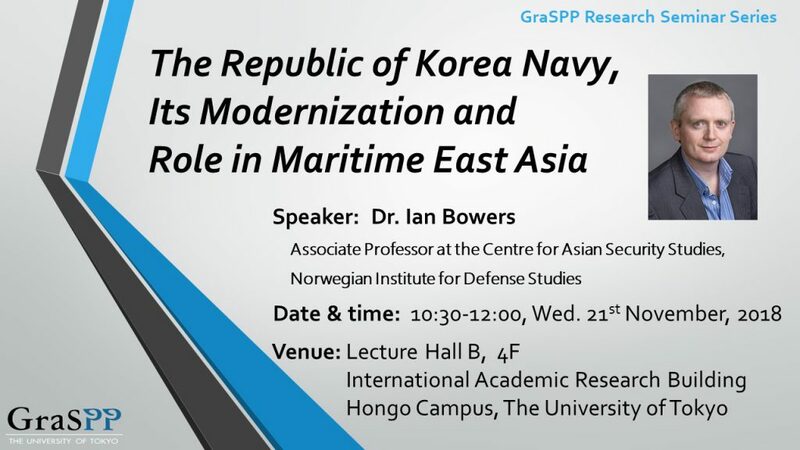 This seminar will discuss how deterrence and defense calculations have shaped the modernization of the ROKN. It will examine the ROKN’s operational role in relation to the Korean Peninsula and East Asia. Dr. Bowers will also discuss the future of the ROKN and its increasing cooperation with allies and international partners. Dr. Ian Bowers is an Associate Professor at the Centre for Asian Security Studies, Norwegian Institute for Defense Studies. His research focuses on naval operations in East Asia, South Korean security policy and deterrence in the 21st century. Dr Bowers has published widely, and his work has appeared in the Journal of Strategic Studies, the Korean Journal of Defense Analysis, Global Asia and the Naval War College Review. His latest monograph titled, The Modernization of the Republic of Korea Navy: Seapower, Strategy and Politics was published with Palgrave Macmillan in 2018.